The German Wehrmacht was impressed with the Soviet T-34 on the battlefield as it was a tough adversary to beat. Armed with a 76mm main gun, the T-34 was effective against the German panzers. During their campaign eastward in 1941 and 1942, the Wehrmacht captured a number of T-34s with some 300 being recycled for use on the eastern front. Depots had been established in Germany and in Riga to modify many T-34s for German use with compatible radio equipment, commander's cupolas, etc. When the Soviets fielded the 85mm T-34/85, the Germans were already withdrawing west so few found their way into German use, though the Germans were leaving plenty of Panzers behind for the advancing Soviet armies. 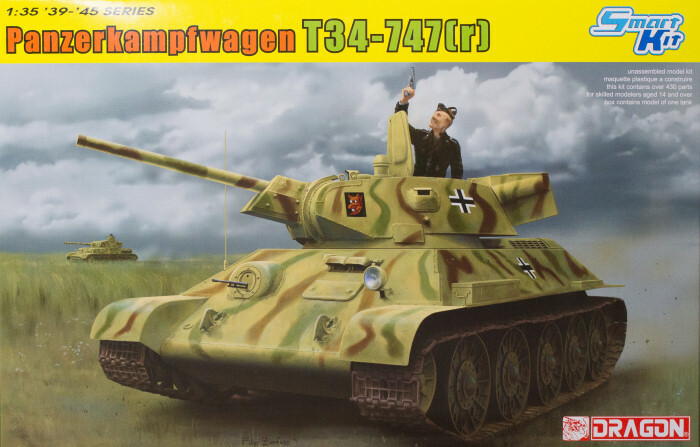 Here is DML's latest release, the Panzerkampfwagen T34-747(r) in 1/35 scale. This one represents a re-engineered vehicle with added vision blocks, stowage box on the rear of the turret, new sights, and more. While there are new-tooled parts added to this kit to render the 'T-34 Under New Management', this kit comes with a variety of parts trees used to mix and match the combination of parts used in this version. Molded in light gray styrene, this kit is presented on twelve parts trees plus separate upper and lower hull halves, two bags of individual track links, and one small fret of photo-etched parts. The front cover of the instructions shows the parts trees and the blue areas show the parts not used in this release - about 1/2 of the kit! If you don't care to build the German updated T-34, you have three different turrets, several different turret tops with different hatch arrangements, two different rear hull plates, and a variety of other options which will help you render the version you do wish to build, or pehaps save these extra parts for a future project. Markings are provided for an example used by Pz.Rgt.31, 5.Pz.Div., Russia, 1942. Thanks to DML for this review sample.